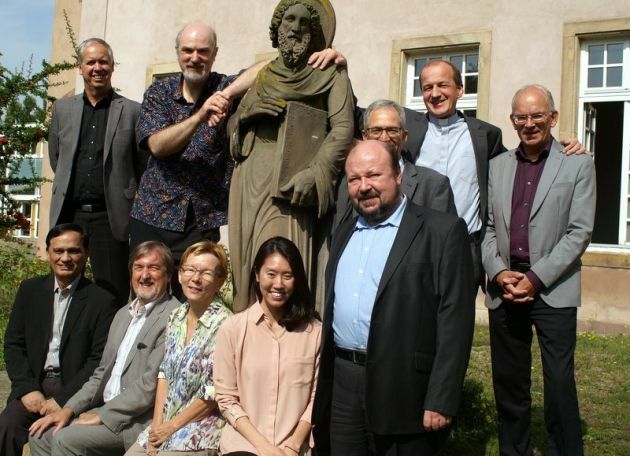 (Photo: Kim Cain)Participants from world-wide Christian organizations and churches who met in Strasbourg, France on September 9, 2014 to discuss ways for church groupings to tackle Christian persecution together at a meeting convened by the Global Christian Forum. The Global Christian Forum's, one of the most inclusive ecumenical body's, says it is to conduct a global consultation under the theme Discrimination, Persecution, Martyrdom: Following Christ Together. In a May 12 statement the forum said the gathering will take place in Tirana, Albania from November 2 to 4. The consultation aims to bring together leaders of churches currently under duress with leaders of churches, global Christian organisations and groups committed to accompany them. The consultation is an initiative of the GCF, together with numbers of churches and Christian organisations that reflects much of the breadth of the forum itself. This includes the Catholic Church (Pontifical Council for Promoting Christian Unity), Pentecostal World Fellowship, World Council of Churches, and the World Evangelical Alliance. "Tirana, the capital of Albania, has been chosen as the location for the consultation as that nation experienced an extended period of religious repression under the former Communist regime," said the GCF in its statement. "In that time, all religious groups, including Christian and Islamic communities, saw religious liberty curtailed, their leaders arrested and sometimes martyred, and property destroyed and confiscated. At least half of the 'Discrimination, Persecution, Martyrdom' consultation participants are likely to come from churches currently experiencing situations of persecution and violence. Regionally Asia, Africa, Latin America and the Middle East will be represented, as will the global North. Following the GCF's own experience there will also be an equal balance between participants from what is often called the traditional/ecumenical churches and those from evangelical/Pentecostal backgrounds. The consultation process will ensure time is given to sharing of experiences and perceptions of persecution, both in groups and plenaries said GCF. There will also be time for cross-fertilisation of ideas as well as hearing informed wider perspectives through presentations. This will be further supported by theological reflection and worship during the participants time together. Towards the close of the gathering themes and insights will be drawn together and commitments to next steps made. "In taking time to listen and hear from those experiencing persecution as well as to share information, it is hoped that a better understanding of the complexity of issues within the arena of Christian persecution will be gained," said GCF. It said the meeting does not aim to devise a "global plan" to deal with the issues of discrimination, persecution and violence. "However, it is the organisers' prayer that communities and individuals currently facing situations of discrimination, persecution violence will feel the support of the wider body of Christ," said the GCF. Through the Tirana encounter leaders of churches and church organisations will be better informed and able to articulate their responses together and within their own constituencies. Research is underway on a glossary of the language of persecution, since the way words are used has an impact on how people understand and respond to the issues. Similarly, data is being collected in order to map the scope of discrimination, persecution and martyrdom, globally at this time said the GCF. As a gathering of those involved in and concerned about the many aspects of Christian persecution, the consultation will allow churches and Christian organisations to be informed as they shape their lives and priorities in their constituencies and traditions.